It’s So Wrong, It Must Be Right (874). These are three Instagram-filtered photos I took on my iPhone over the course of about 24 hours this past weekend. The photos don’t look so hot enlarged beyond the confines of my mobile screen. They are deliberately out-of-focus, save for the digit on the boy’s jerseys. I deliberately put that apostrophe in the preceding sentence between the “y” and the “s,” as well. “Boy’s” in the singular possessive rather than “boys'” in the plural. I know my way around an apostrophe, you see, as I am the product of two long-time, and now long-retired elementary school teachers. It’s so wrong, it must be right. This is mostly all my doing. Whatever prison psychiatrist down the road is assigned to Max will surely point a crooked finger back in time straight at me, Max’s dad. Or more accurately, at Max’s dad’s curious obsession with piling on, at leaving all the doors in a hallway swung wide open, at flirting with overscheduling disaster, at jamming 36 hours into a 24-hour day, the zippers threatening to come unzipped at both ends and spilling their contents all over the pavement. 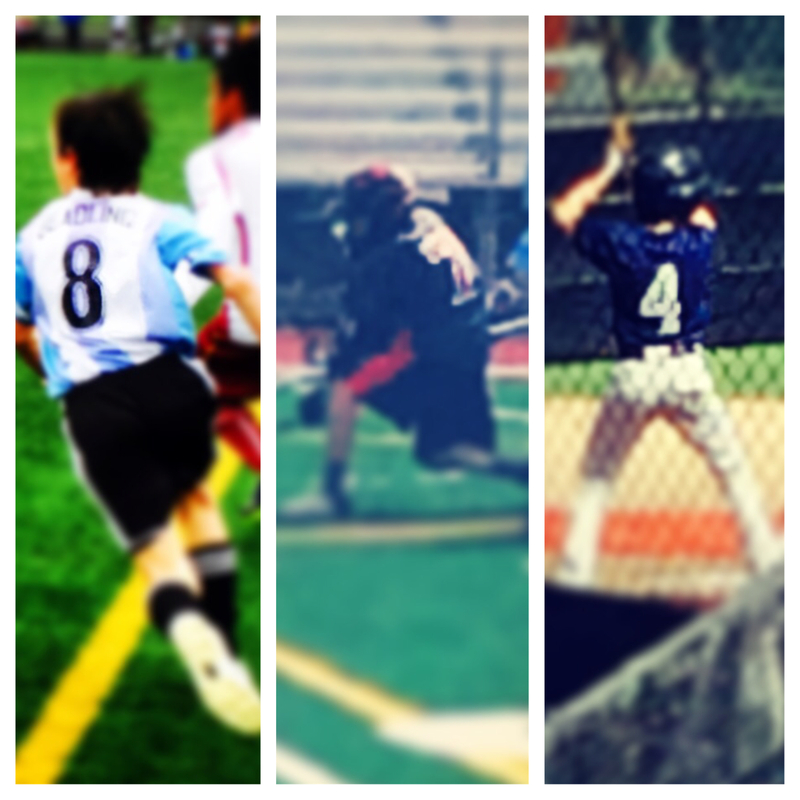 This Spring, Max has committed to travel soccer, travel baseball, travel lacrosse, and Little League. Arguably, he did not so commit under duress; this was all done of his own volition. His coaches have sized me up, looking for a clear indication that I am bent. Crazy. Some uncontrolled twitch at the corner of my mouth, perhaps. Or a sudden, Hyena-cackle laugh, totally out of proportion with the rest of my affect, maybe even in reaction to nothing perceptible. Out of the blue. “The guy’s lip was twitching like mad, he laughed like a maniac, and there was nothing even remotely funny at the time. I’m telling you, he is clearly crazy! No right-thinking person would put his first born through this.” This is how I imagine the coaches’ side of the phone conversation with League officials that my actions might trigger. I myself am a coach, and have been one for a long time. If a parent told me they had committed their child to all of this stuff, I would also be on the lookout for a telltale twitch. I might even effect a citizen’s arrest. This must fall under one or another definition of “child abuse,” no? I grasp at any seemingly-objective support that might justify this overcommitment. A real-life and Facebook friend shares a blog post espousing the benefits associated with children participating in multiple sports rather than specializing in one. I avert my eyes at the blog post’s title: “The Race to Nowhere in Youth Sports.” The blogger can’t possibly be talking about me, after all. I practically jump up and down, clapping my hands too quickly, when a coach of older boys or a former professional player of one sport or another tells me that Max should play as many sports as he can for as long as he can. And this really isn’t about me. At least I don’t think so. Although I do indeed wish I had played more sports rather than focus on just baseball, I really can’t begrudge baseball. That sport helped raise me. I’m still passing along both long-established and newly-discovered lessons to my young players, by the bushel. I don’t feel any phantom pain where “the larger meaning of sport” should be. I do, on occasion, think about whether my great grandfather, who was apparently a world-class sprinter, passed genes on to me that I somehow managed to let slip through my fingers along the way. Then again, those thoughts prove helpful in the belly of the beast of a long run or ride. The notion–real or imagined–that there just might be something inside me that is a little different, a little secret sauce, that will enable me to run one final 7-mile lap around this lake in the moonlight. Hey, whatever works.